Makers of the no. 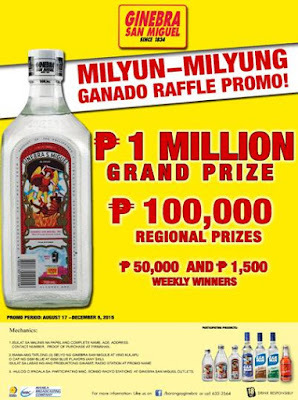 1 selling gin in the world Ginebra San Miguel, had officially launched its “Ginebra San Miguel Milyun-Milyung Ganado Raffle Promo” nationwide promo last September 9. 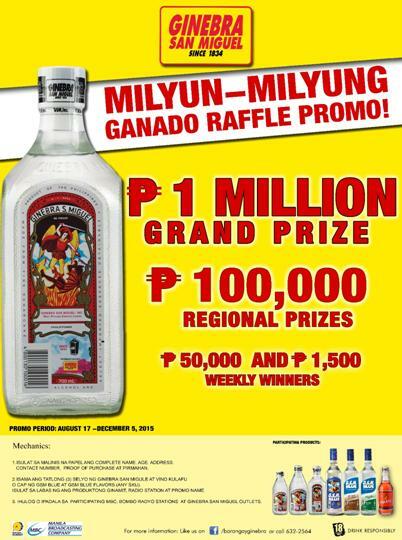 Millions of pesos in exciting prizes will be given away in the weekly, monthly and regional draws. Regional winners from Metro Manila, North Luzon, South Luzon, Visayas and Mindanao will take home P100,000 each, with one winner of P50,000 per region each week. 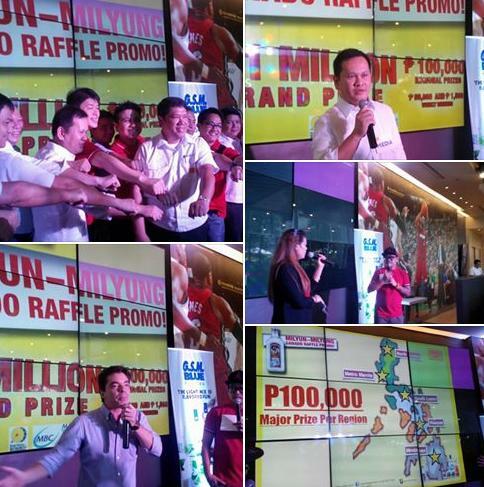 And a lucky winner will get to take home P1 million in the national Grand Draw on December 5, 2015. “This is our way of giving back to our millions of kabarangay for their continued patronage and support – para mas maging ganado pa sila sa buhay, at mas maging masagana pa ang kanilang Pasko,” adds Elises. This promotion is in partnership with the country’s leading radio networks Manila Broadcasting Company (MBC) and Bombo Radyo Philippines (Bombo). To join the raffle, simply write your complete name, age, address, contact number and signature on a sheet of paper. Enclose entries in a white, legal-size envelope along with any of the following proofs of purchase: 3 seals of any variant of Ginebra San Miguel, 3 seals of Vino Kulafu Classic, or 1 cap of GSM Blue or GSM Blue Flavors. Drop boxes are located at Bombo and MBC radio stations plus in participating supermarket outlets nationwide. Like the official Facebook fanpage of Ginebra San Miguel or log on to www.ginebrasanmiguel.com for more details on this exciting promo.